His gravestone records his age at death as 58 years, 5 months, 26 days. He agreed to a realignment of a road with the Town commissioners of highways. He was one of the first trustees of the "Temporalities of the congregation of Southaven" at the time of its incorporation on January 19, 1802 following the Revolutionary War and remained a trustee until his death, serving for 24 years. While he is often referred to as "Senator" Rose, it appears that the only state office he held was that of assemblyman. According to the New York Civil List of 1871, which has an alphabetical list of State Senators and Assemblymen from the late 1700's onward, John Rose only served as an Assemblyman from Suffolk County in 1810. His name does not appear anywhere on the list of Senators. This house has Historic Structure ID Br29B. His gravestone is found in the old Rose family plot at the Oaklawn Cemetery. Since his death was long before the establishment of the Oaklawn Cemetery in 1890, he was buried elsewhere (probably the defunct Rose family cemetery that existed near the Brookhaven Free Library). John Rose and Elizabeth Rose were of unrelated Rose lines. Elizabeth's father was Priest David Rose, pastor of the South Haven Presbyterian Church, who descended from Robert and Margery Rose of Wethersfield and Branford, Connecticut. John Rose was a son of Thomas and Deborah Rose, early settlers of Fire Place, who descended from Robert and Dorothy Rose of eastern Long Island. This marriage therefore joined two early Rose families. They had five sons. 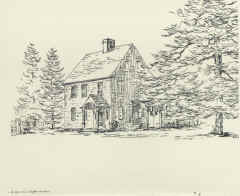 Mulford, the last, inherited the home on Beaverdam Rd., Brookhaven (formerly Fire Place), NY, which is still extent. ..this house was built by John Rose in the early years of the 19th century. It continued to be occupied by members of the Rose family into the 20th century. More Information see document ID Br29B. .. this notice published in The Corrector (Sag Harbor, NY), 19 November, 1831, describes the full extent of the John Rose estate at the time of his death. .. Beaver Dam Road, Brookhaven, NY. This document is the Brookhaven/South Haven Historic Sites Data Sheet Br29B on this site. .. first interred at the former Rose/Swezey cemetery at Library lane & Beaver Dam road, and removed here by James H. Post. [S59] Munsell's Suffolk Co. History: 1882, https://archive.org/details/cu31924028834848., Town of Brookhaven, p. 70..
[S39] Bigelow, p. 4, 62. [S150] 1790 Census, M637 Roll 6 Page 100. [S4] Brookhaven Town Records:, Book A, Part III, 1790-1797, p.127. [S4] Brookhaven Town Records:, Book A, Part III, 1790-1797, p. 129. [S399] Liber A, Suffolk County, NY, p. 18. [S365] Email: NY State Library Reference Librarian. [S527] Brookhaven Town Records: 1798-1856, p. 140. [S787] Rose, Christine: Descendants of Robert Rose, p. 251. Indicates "aged 58 Years 5? months and 26? days."